“L a u n d r y”… Yes the LAUNDRY! Quite sad isn’t it lol. Well the saying “Laundry today or naked tomorrow” will definitely become true if I didn’t visit the Laundry as often as I do! 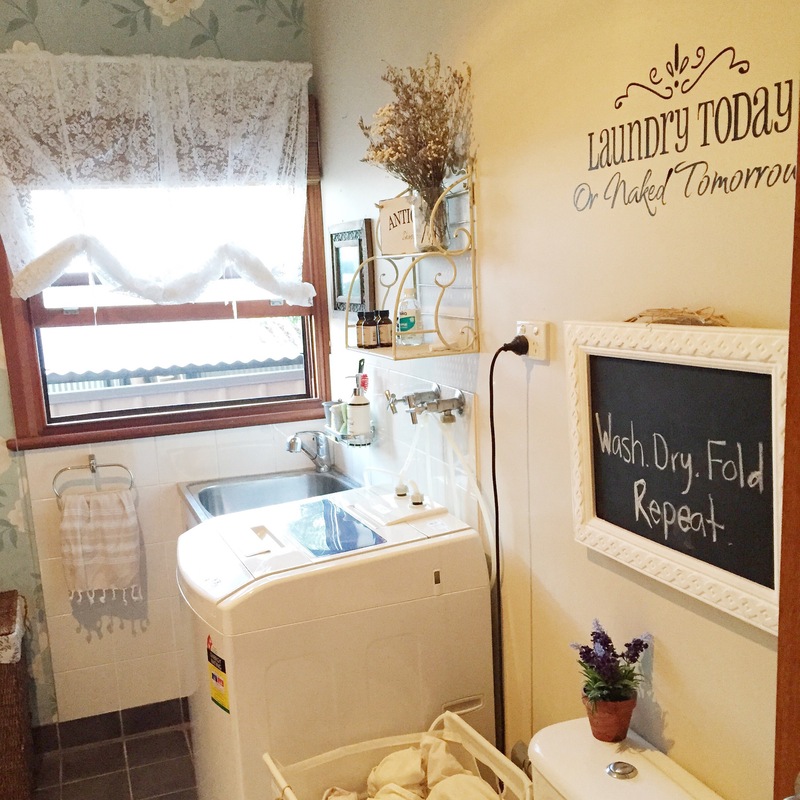 Keeping my Laundry room as organised as possible simply helps me go about my day smoothly. The one thing that drives me mad is a Laundry filled with washing that hasn’t been sorted. I don’t know which it is really- the washing itself or the fact that I’ll have to rummage through the mountain of clothes to load the washing machine. Let’s be a little realistic here if we don’t do the washing ourselves…who would? Is that selfish to say? Regardless, I think it’s the honest truth! I will love to share with you the current state of my Laundry! I’ve been wanting to redecorate for some time now- when that happens I’ll do an updated post of the changes. What is a laundry room without the cleaning products themselves? How do you store your powders & softeners? I have simplistically stored the washing powder is a tin that was already assigned for washing powder. I store some of my softeners in glass bottles however, I’m looking into storing them in “drink dispensers” in the new look I’m going for in our laundry. I’ve placed soap bars in glass apothecary jars- makes the shelf, great storage solution while also making it look pretty at the same time. The “soak” bucket pictured above is used to store “delicates” I include school uniforms in this category also. How I go about storing washing are in these great hampers from IKEA which cost us only $4.99, with having to buy 5 of these the price tag was a huge help! 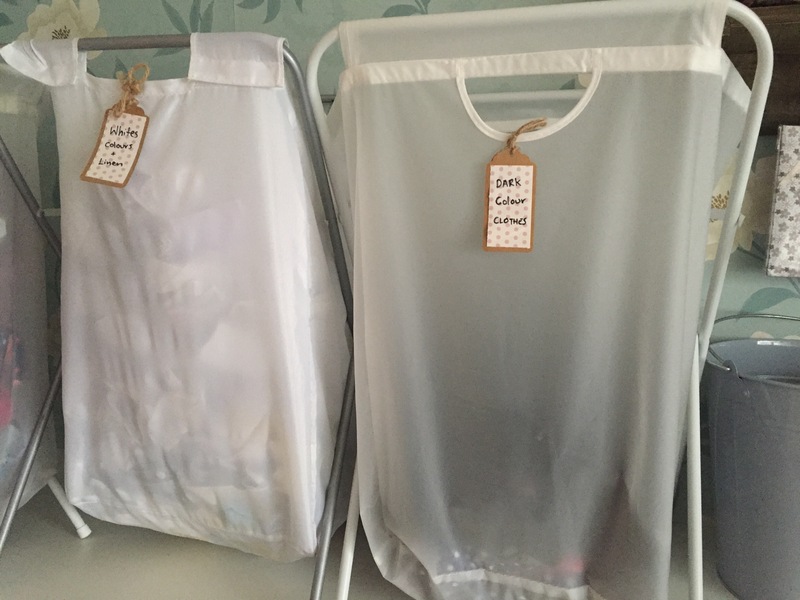 I don’t mix and wash my kids “light coloured” clothes amongst mine and my husbands light colours- I believe that our “light” colours tend to be more harsh then kids clothes and I simply just don’t feel comfortable mixing them. I label each hamper, making it easy for the hubby and kids to put their OWN dirty washing in the laundry! You should see them go they sort washing like professionals LOL! 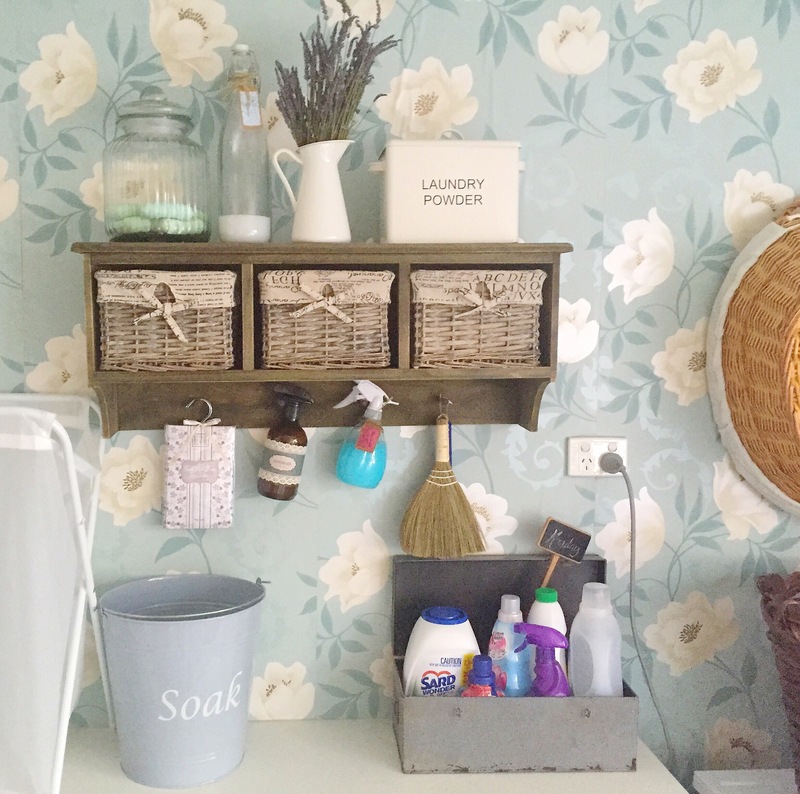 The pretty additions, wall art, flowers & displaying the delicious scented essential oils on the shelf above the washing machine. Finished off with a cute lace handmade curtain & Turkish tea towel. Love your laundry! Where’s the shelf with the wicker drawers from?